Be the first to share your favorite memory, photo or story of Rudolph "Woody". This memorial page is dedicated for family, friends and future generations to celebrate the life of their loved one. 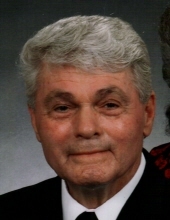 CLAYTON: Rudolph “Woody” Woodall, 82, passed away on Tuesday, January 22, 2019 at his home in Clayton. He was the son of the late James Albert Woodall and Rachel Lucille Outland Woodall. After 20 years of service, Mr. Woodall retired from the United States Army. While serving, he accomplished two tours to Vietnam. He was also a member of Lawrence Road Baptist Church. Mr. Woodall is survived by his wife, Saundra Kay Woodall; daughter Debra Woodall Riley and husband David; sons, Larry Dwayne Woodall and wife Bethany, and Mark Alan Woodall and wife Amanda; brother, William Milton Woodall and wife Juanita; sister Sandra Renae Edge and husband Steve; and grandchildren, Ashley Woodall, Cole Woodall, Rachel Ross, Alayna Woodall, Beau Riley and Aubrey Riley. A graveside service will be held at 10 a.m. on Monday, January 28th at Sandhills State Veterans Cemetery. A visitation will be held at Clements Funeral Home on Sunday January 27 from 6-8pm. To send flowers or a remembrance gift to the family of Rudolph "Woody" Woodall, please visit our Tribute Store. "Email Address" would like to share the life celebration of Rudolph "Woody" Woodall. Click on the "link" to go to share a favorite memory or leave a condolence message for the family.